We’ve had so many this season here in Arizona that I thought the topic deserved some comment. Let’s distinguish first between dust storms and sand storms. The two are really on opposite ends of a spectrum. It’s all about particle size. In a dust storm, the particles are very small. Smaller than a grain of sand. And some smaller than you can see. But they can still create an ominous nearly-opaque cloud as seen above. 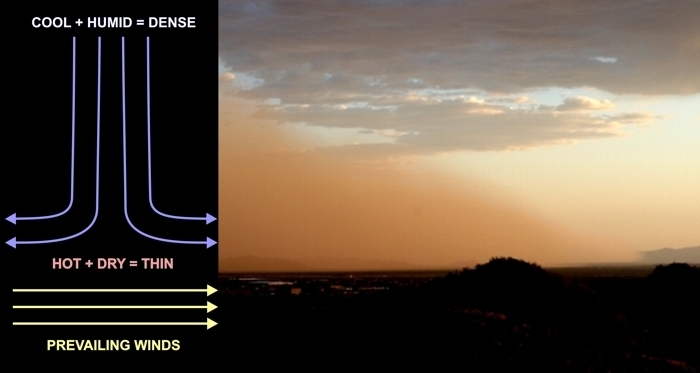 With a sand storm, particles the size of sand or larger are moved by the wind. Dunes happen. 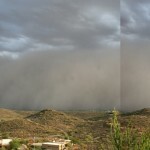 Whether it will be a dust storm or a sand storm depends on local geology and ground cover, as well as wind speed. In Arizona, dust storms are more common. In the Sahara Desert, sand storms are more common. Two totally different mechanisms can create these events. In one case, a large mass of dense air reaches a point of instability and rapidly sinks to the surface, like a rock falling through water. This downdraft of air has to go somewhere, and that direction is outwards (blue vectors in above graphic). If it moves over a dusty or sandy surface, and the wind speed is high enough, you get a dust or sand storm. The other mechanism is simply a strong prevailing wind, common in large open areas, like the Sahara (yellow vectors). Lower wind speeds create a dust storm, moving smaller particles; higher wind speeds can move sand, small pebbles, and tumbleweeds. See: http://en.wikipedia.org/wiki/Dust_storm. The last large dust storm that hit here in New River, Arizona was one of the largest I’ve seen. The image below is a thumbnail, but you can click on it for a full window view. Is that ominous looking or what? I didn’t have time to swap my wide-angle lens into my camera, as the dust hit within a minute of this shot. So it’s a panorama of 3 frames stitched together digitally. The dust front is about 300 meters away. Finally, here’s a video I created from a time lapse sequence of shots taken directly west of here. One frame is 10 seconds from the last, and the video runs at real time. Based on the distance to those mountains, I estimate the dust cloud was about 2000 feet tall, and advancing at 40 mph. Just click on the screen to play the video. It’s a great shot of Mother Nature in action. Great article, Dan. It clearly explained the Dust Storm phenom. I even learned something!